Integrating digital PR into your inbound marketing strategy will not only help build brand awareness, but it will also help generate more leads and get your content in front of millions of people. Let us begin by saying that for B2B companies, it is still important to maintain a presence in targeted trade publications. This is where you can count on your prospects congregating and having your content on these sites puts your organization front of mind. And like every media company, trade publications are hungry to build content online, which will work to your benefit, especially with an optimized digital PR campaign. Having an earned presence in these trade publications builds your brand in the eyes of your prospects, which can quickly result in higher revenues for your company. When building your digital PR strategy, you want to be sure to focus your efforts on sites that post a continuous stream of expert content. These sites are the ones that generate huge numbers of inbound links and usually have done a good job building a strong (and loyal) social media community. Why? 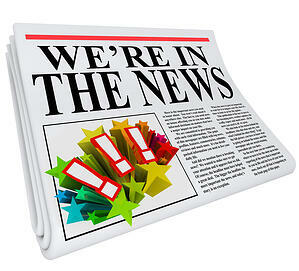 Because these sites have an advantage when it comes to search engine ranking. If optimized, your digital PR campaign will get much more traction and higher rankings when featured on these types media sites. By just optimizing the content on your own and posting it in the news section of your website (with fingers crossed tightly), you won’t see the same results. And yes, it is that plain and simple. We are very particular about which keywords we allocate to Blogging, Digital PR, On Page SEO and PPC because each play a different role in your strategy and are ranked differently by the search engines. Strategically selecting and allocating your terms across these different channels, helps you optimize the return on your marketing investment (and higher ROI = happy boss). The goal with our digital PR efforts is to drive more traffic to your website and get your company’s news in front of millions of people. To get a better handle on why keywords are so integral, it’s important to understand parts of the search engine algorithm. Search Engines originally developed their ranking models based upon the value of scientifically published papers. Meaning papers that were cited more often were seen as more credible, and therefore more valuable. Papers that were cited by highly respected editors were even more so. Therefore, in addition to on-page factors, which help a search engine discern what a page of content is about, they also developed off-page factors, which helped discern how a specific page should rank within the list of pages it’s collected with. And digital PR plays into this because you’re trying to get your content distributed on these “trusted” networks. This will build your online brand presence and create valuable inbound links, driving more traffic (and potential customers) to your website. Now we want to walk you through a quick example for one of our clients. We leveraged a highly targeted keyword within our client’s press release (which our content team drafted for them), distributed it through our content distribution channels, and got them ranked on the first page of Google for that term. 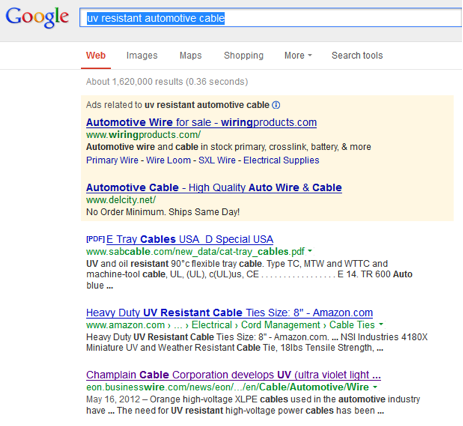 In this example, you can see the “UV Resistant Cable” is very high competition, but relative low search volume, with makes it a long-tail keyword. For reference’s sake, 1.0 is the highest ranking for difficulty on the Google scale. Our strategy was to develop an optimized digital press release that would be designed to drive traffic to our client’s site and start generating more leads for them. We were able to achieve our goal of driving high quality traffic to SEO optimized landing pages. The digital PR pages ranked much higher than was possible with targeted landing pages alone, and after reviewing the results of the campaign, the inbound links did end up driving highly targeted traffic through to landing pages, resulting in more highly qualified leads for our client. Having a marketing automation platform and an integrated CRM system in place, that are finely tuned to measure sources of traffic all the way through to revenue, will help you see that digital PR will be one of the higher sources of quality leads. Why? Because in addition to building your brand (trust), you are capturing and directing highly targeted personas to your site. With these types of metrics tools, you will also find that there is a case for ‘attribution’, meaning a lift in searches that result after someone has seen a banner ad or read a press release, further enhancing your ROI.